Have you ever wondered what other IT managers and leaders are investing their budgets into? Here are some really interesting market research results. Thank you to my friend, Chad Sakac, he posted an article today referencing the following. 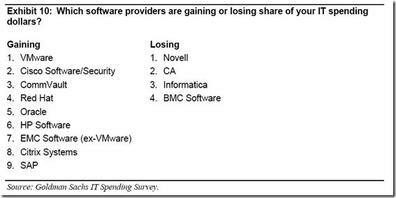 On Sept 8th, Goldman Sachs released their annual survey analyzing IT spending - the "Independent Insight" here's how THEY describe it. In this post, I am taking most of the content from Chad and rewording it slightly. First, for my VMware colleagues, congratulations! 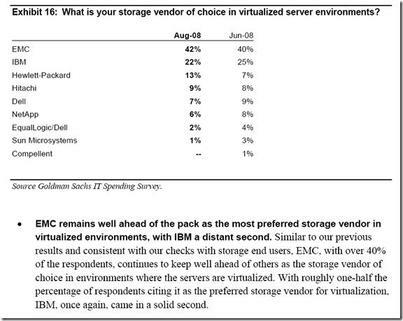 Nice to see EMC Software (which excludes VMware) also in the gainer column - our management tools, and products surrounding backups, archiving, and document management are very popular. Here is more interesting information on the market segments. IDC published these results recently as well. Click here for the IDC Report. The NAS numbers and growth numbers are stunning. LASTLY, DO NOT PICK A PRODUCT JUST BECAUSE OTHERS ARE DOING IT. Every customer should pick solutions that work for them. I share these with you becasue a company cannot produce these kinds of results and outgrow others, and do it across categories without doing something right for their customers.